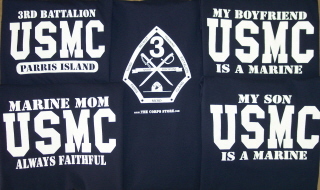 3rd Battalion Parris Island T-shirt has the battalion logo on the back.� The family t-shirts also �have the battalion logo�on the back. Select from: My Son is a Marine, My Step Son is a Marine, Marine Mom, Marine Dad,�My Grandson is a Marine, My Brother is a Marine, My Brother-in-law is a Marine, My Nephew is a Marine, My Cousin is a Marine, My Husband is a Marine,� My Boyfriend is a Marine, My Friend is a Marine or Marine Wife t-shirts. Also for families with multiple Marines, My Sons are Marines, My Grandsons are Marines and My Brothers are Marines!� Sizes small to 4XL available with no additional charge for larger sizes! AVAILABLE ONLY AT THE CORPS STORE!!! !